To Quashqai owners concerning the subject what fuel consumption figures are you getting with a 2 litre petrol engine about town and on motorways etc, not interested in what the official figures say but what the owners say. With cvt usually 36-39 long motorway and 32-33 short journeys to work and back. Providing i dont see any of those oil burner diesel ones about and fly past them to show how clean the petrol engine is. Understeer is when you hit a fence with the front of the car. Oversteer is when you hit a fence with rear of car. Horsepower is how fast you hit fence. Torque is how far you take fence with you. Baby Bloo has cvt and I have achieved about 38 to 39.6 on long motorway journeys and 33 to 36 short journeys, 32 ish around town. Nice figures for a petrol machine. You will love it to bits. i dont see any of those oil burner diesel ones about and fly past them to show how clean the petrol engine is. So you fly past invisible cars, i think you will find we can all do that. Everyday trip from Croydon to Central London on A23 [busy one] and on average I get 24mpg. Motorway, 33miles long trip, average speed 70mph and QQ does 37mpg. I'm still under 1k so I drive gently. Overall average currently 29.9 (maybe 70/30 town and motorway split) I don't tend to check each trip mpg, as I think overall average is what you want to know. Before annual service 29.5mpg, after service(1month ago) 33.5mpg! At 2,500+ miles have 38.9mpg overall indicated since collection from the dealer. At 3,000 miles had 38.9 and 4,000 miles 39.2mpg but that was a trip on the motorways in France and around the Normandy countryside. At 6000 miles we are at 38.1mpg having been restricted to short trips around town for the last couple of months. Interesting to find the battery 'tell tail' was black, not green after this sort of running @ 6K. No problem starting yet! At 7,000 miles we are at 37.8mpg having done a lot of town driving. 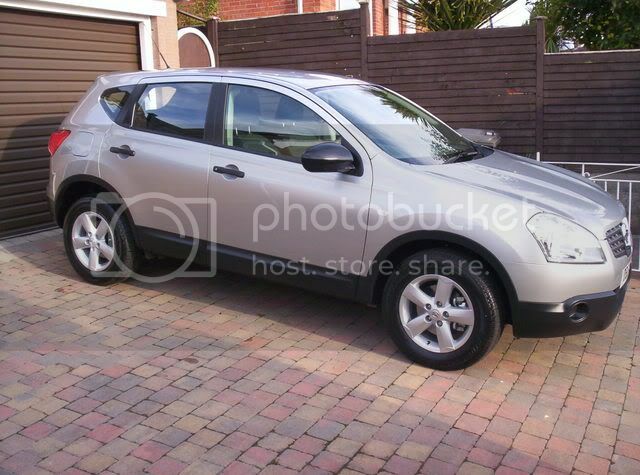 Then travelled to London for the first service because the agency I bought it from went bust! Brill Aberqai, who needs Doosle in thier tank ? Over the 15k I have done so far I only check overall average mpg and the more miles you have done, the less likely any changes in driving for a trip or two will affect that - it's just maths - agreed? OK - over that 15k it has varied from 29.3 to 29.6. Not bad for the juiciest variant. I normally use cruise on the motorway every now and then at say 70-80 and do short 3 mile each way trips to work each day during the week. We have just got back from a week in Dorset/Somerset/Devon which comprised mostly slow twisty lanes, motorways where it wasn't worth using cruise due to traffic and a superb high revving thrash with another driver who just wouldn't give in . Now that must be comparable or worse than my usual week eh? So why is she now showing an overall average of 30.2, meaning that week must have been - what? - over 40 to affect the average like that? So from now on it's thrashing/no cruise control for me . My God, am I glad I have the 1.6 petrol model. Have done about 500 miles in the week or so I have had my Qashqai and the average mpg for that time is over 45 mpg. I know you have a bigger, faster engine and get better performance but the fuel consumption is more reasonable! Yer pays yer money and yer makes yer choice. This here is a topic for us 'loadsamoney-stuff the planet-gas guzzlers' kingarthur64, not 'miserly-planet-saving-whogetsthebestmpgers'. Now go and count your pennies elsewhere, while we single-handedly help that nice Mr Darling and the fuel industry through these difficult times. I'll get my coat then! ..............no need - we 2.0 folk still love you, even though you've only got a lttle 'un . Filled my tank up to day, done a total of 301 miles from a full tank, 4 weeks ago. Put a total of 11.6 gallon back into fill up the tank so my MPG is 25.95MPG around town, leaving 2.65 gallon in the tank when petrol light came on. I don't expect to get any more than this about town driving, otherwise the car is fine. Will update every now and again to see how things go. oh yes - I get that, but I have done similar trips before and to suddenly affect an average taken over 16k miles, which has never really varied, it seemed a surprise that's all. got my 2009 spec acenta i love it!!! i would post pics for some reason it wont let me. i read the thread about adding them aswell. Your MPG will vary between around 25mpg on short journeys to around high 30,s on longer journeys. Also the manual box will probably do a little better. I noticed on the first QQ 2.L CVT we had that the MPG was a bit better after the first service. We now have a +2 same engine and CVT and its doing on average around 27mpg which i think is ok as the car is heavier. Filled Sqashy up once more covered 326.5 mile, averaged 26.6 mpg. I still think how you use your car over the first 1000 miles or so will reflect on the engines longevity and performance . Not checked the range yet but i will over the next few weeks. My 2.0 manual 4WD QQ has now done 12000 miles over 12 months at average speed of 30+ mph and I have achieved 32.6mpg which I think is pretty good for a 2 litre. i done 340 mile just town driving and my overall mpg is 29.6 if its stay like this ill be happy. I have just returned from a trip around Weardale and Teesdale a journey of approx 120 miles with some long steep hills and moorland driving and returned 37.2 MPG which I was well pleased with as the car is only 2 days old. My previous car was a Nissan Note 1.6 automatic and I would average about 40 MPG on a similar trip. I'm in a similar boat. The car is just over 2 weeks old but I've only clocked up 120 miles so far (been away on a course for a week). My average is 35.7mpg but most of those miles have been pretty urban driving so when the engine has loosened up I'm pretty confident of late 30's on a decent run. I'm impressed by how well she pulls fom low revs even though the engine is clearly still tight. THESE FUEL MILES UNTIL EMPTY GAUGES..........THEY CONSTANTLY VARY.........THEY ARE LOOKING ALL THE TIME AT YOUR DRIVING......FAST SLOW....UNDER LOAD......SPEED.......UP HILL......DOWN HILL ETC. ETC. EVEN THEN WHEN THE GAUGE SAYS YOU HAVE NO MORE MILES LEFT IN THE TANK..........YOU HAVE.......DON'T QUOTE ME OR RUN TIL EMPTY, BUT YOU CAN GENERALLY GET ANOTHER 60/70/EVEN 80 MILES AFTER GAUGE SAY'S EMPTY!!!! LOVE MAKING BETWEEN TWO PEOPLE IS A BEAUTIFUL THING.........YOUV'E JUST GOT TO BE IN-BETWEEN THE RIGHT TWO PEOPLE. Fuel consumption update, covered 372 miles using just over 12 gallon so works out about 30.87 MPG, done town driving and about over 100mile of motorway driving so not bad for the 2L petrol. Thats about right loveman. The more motorway driving you do then the MPG will go up. Our QQ is presently at 32.7 MPG . It's been up to around 35 plus at one point. The previous QQ 2L petrol we had even got up to 39 MPG sometimes . So there is room for improvement. I usually average 32mpg but did manage 45mpg on a 250 mile motorway run once in my 2.0L petrol. Slow. Boring. Lots of cruise control at 60 mph. But possible.